His assignment was to graze cows that had been looted. He was also charged with slaughtering them, roast the meat for his bosses who were out at “work” all day. He carried out the same task every day and night. Despite all the cruel assignments however, the only reward was beatings by the same bosses he served. The punishment was always one; to lay down on the floor, close his eyes and wait for the worst. He was beaten and for many of the days, locked up inside a house. All this ordeal happened every day at 5 am. Welcome to the world in which Sylvestre Rusanganwa lived for weeks before, all through the genocide period. To find Rusanganwa required walking from hill to hill under scotching sun. For some days when we were out looking for him, it was raining heavily – the same conditions of 1994. Rusanganwa last owned a phone more than six years ago. His face is battered, and looks older than his age. When Rusanganwa starts a conversation about his story, the 54-year-old breaks down into tears before he even says anything. The interview with KT Press had to be interrupted several times to allow him regain composure from the traumatic memories. When the Genocide against Tutsi started in the former Butamwa Commune (current Mageragere sector), just outside the capital Kigali in 1994, Rusanganwa was working as a casual labourer for Saveli Kangavela, a very powerful local official. Rusanganwa worked on the farmland. Kangavela was in 1994 the conseiller of Butamwa sector, one of those that made up Butamwa commune. In this area alone, a head count of the Tutsi massacred reached more than 8,000 victims. Butamwa region has another strange and painful chapter. The killing of Tutsi began some weeks before April 6, 1994, when the plane of former president Juvenal Habyarimana was shot down. The genocide went into full scale mode the next day for the next three months. According to survivors and perpetrators, the plan was to erase any trace of Tutsi in the area. Even mentally ill or elderly ones would be found in houses and killed. The uninhabited hills of Butamwa today are testament. But for Rusanganwa, there was a different plan. It was April 2, 1994, when his employer Kangavela summoned Rusanganwa. “My employer trusted me so much that he had left everything on the farm to me,” he narrated, with tears starting to roll down his face. At this point, again like it had been at various times before, Rusanganwa couldn’t hold: he was in tears. “I could not understand what was happening around me. Seated next to Kangavela was Ruberangondo,” he continued, referring to former (bourgumester) mayor of Butamwa commune. “Both of them told me I had been spared from death such that I would be exhibited in a museum where tourists would get to know how a Tutsi looked like,” added Rusanganwa amid tears yet again. From that horrific incident, Rusanganwa took on a new job. He was made to collect items from homes of Tutsi that had been killed. Whenever the interahamwe looted cattle Rusanganwa was charged with grazing them. And when they wanted meat, he slaughtered and prepared the meals for them. He was not allowed to taste the meat. During the Genocide, Rusanganwa’s two sisters were brought by Interahamwe militias near the place where he was grazing cows. “They killed them before my own very eyes,” he said. Whenever the militias paused from killing every evening, they sang different slogans in mockery of Rusanganwa. “They always ate meat, then ordered me to collect the bones and dump them where my relatives’ bodies were,” the old man narrates. When Interahamwe militias realized that Rwanda Patriotic Front (RPF) rebels had advanced towards Kigali, they changed strategies and the killing spree escalated. This was probably Rusanganwa’s last breath. 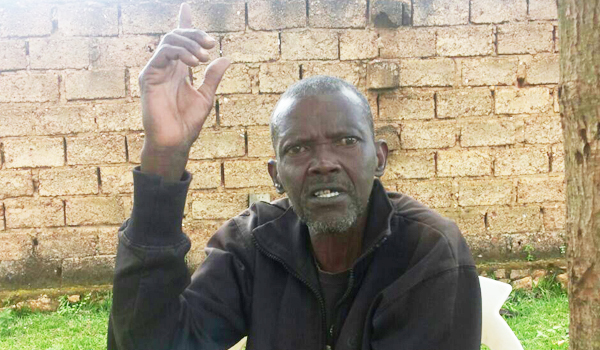 One evening, Rusanganwa told KT Press, Kangavela, Ruberangondo, Fidele Rwambuka – the Former Burgomaster of Kanzenze commune and Jean Baptiste Gatete – former Burgomaster of Murambi Commune in the East, chaired a meeting at Kangavela’s home. Gatete is serving 40 year jail term for genocide slammed on him by the international criminal tribunal for Rwanda. “They told the interahamwe that RPF rebels had approached Kigali and that it was time to finish the job as soon as they could,” narrated Rusanganwa. “I remember Kangavela turned to me saying I was no longer a Museum Tutsi. That instead I was to be kept under his pillow. He was actually saying I was going to be added on the list of his victims,” Rusanganwa told KT Press. On June 6, 1994, the Interahamwe militias started leaving Butamwa. Around the same time, fierce battles had been raging across Kigali as government forces struggled to maintain control, and the rebels fought to halt the mass massacres. Thousands of Tutsi had been killed. Bodies were everywhere. And for Rusanganwa, it was time to try his own luck. Either he escaped, or would be the last person killed before his bosses left the region. He managed to sneak out of the village. “I left Kangavela’s home at night, went through the bush and found myself in Runda (currently Kamonyi district). It took me three days to reach Runda,” Rusanganwa says. Under normal circumstances it can take about 3 to 4 hours walking from Butamwa to Runda, less than an hour by vehicle. While in Runda, RPF soldiers found him nearly dead in the bushes. Many Tutsi were retrieved by the rebels from strange locations. “At the time the RPF soldiers found me, I was suffocating. I could not walk 18 meters without fainting,” says Rusanganwa. The rebels told him the killers had been defeated and that it was safe back home in Butamwa. On his way back to Kigali, Rusanganwa met an elderly woman who gave him sweet potatoes. “I fell asleep after eating due to prolonged starvation,” Rusanganwa told us. As Rusanganwa was struggling to swallow the piece of sweet potato, and gasping for breathe an RPF soldier held him in his arms. Rusanganwa was revived back from what he called “hell on earth”. “The soldier gave me bananas, saying they would help me regain some energy,” Rusanganwa remembers. After eating two pieces of bananas, Rusanganwa embarked on a long walk to his home in Mageragere – arriving on July 13, 1994. 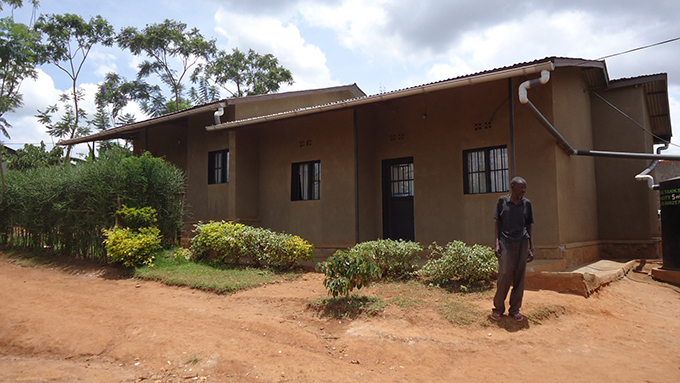 Today, Rusanganwa lives in Kiberinka village, Rugarama cell, Nyamirambo sector in a house given to him by Ibuka – an umbrella organization of genocide survivors. He prefers to look forward, than dwell on the hate for his tormentors back in 1994.